The type of cooking I love the most is when you have a few simple ingredients that you add the together, and the result is so much more than the some of its parts. It’s like magic, really! This excites me to no end and I love sharing those recipes with you readers. The recipe below may sound simple, and it so is – if it didn’t involve a knife anyone could do it blindfolded – but the reward is grand. 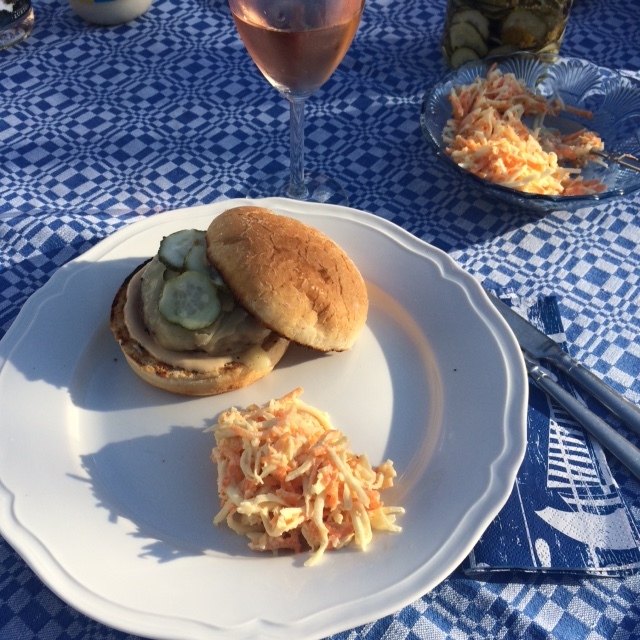 It’s the perfect recipe to remember for those light summer lunches in the summer when you’d rather sip rosé with your friends than cook (see evidence below). Mix creme fraiche and mayonnaise, then add the apple cubes and dill. Stir together and season to taste. Serve with fish. Hello dear readers, are you still there? Sorry about my unplanned break; before the summer I just didn’t have time to update the blog, and then I was away for three weeks and have now been back in London for two weeks. I feel more rested and obviously have lots to tell you about, but I will start easy and share a yummy salad recipe and the best dressing recipe ever with you. After having seen Cobb salads on almost every single menu when I was in America, but never felt like it would satisfy my hunger after walking around all day, I couldn’t wait to make it when I got back to Blighty. It’s a perfect salad to go for if you want something substantial; not just a few lettuce leaves. Make sure you enjoy it while the Indian summer is still here. Trim the chicken thigh fillets, brown in butter in a frying pan, add salt and pepper and cook in the oven (15-20 minutes). Fry the bacon until crisp and drain on kitchen towel. Cook the eggs how you like them. Hardboiled are best for salads but I personally prefer a looser yolk (6-7 minutes). Slice the chicken, bacon and cube the (cool) eggs. Divide the salad between two plates or bowls. Add the toppings (it doesn’t have to be in neat rows but I quite like that). Serve with the dressing of your choice. Maybe ranch dressing? Recipe below. Adapted from The Huffington Post recipe. Mix all the ingredients in a bowl and whisk until smooth. Or add all the ingredients to a jar and shake until smooth. With my parents in town for a few days we had some dinners out planned but also wanted a more chilled out dinner at mine, and this is what I cooked. 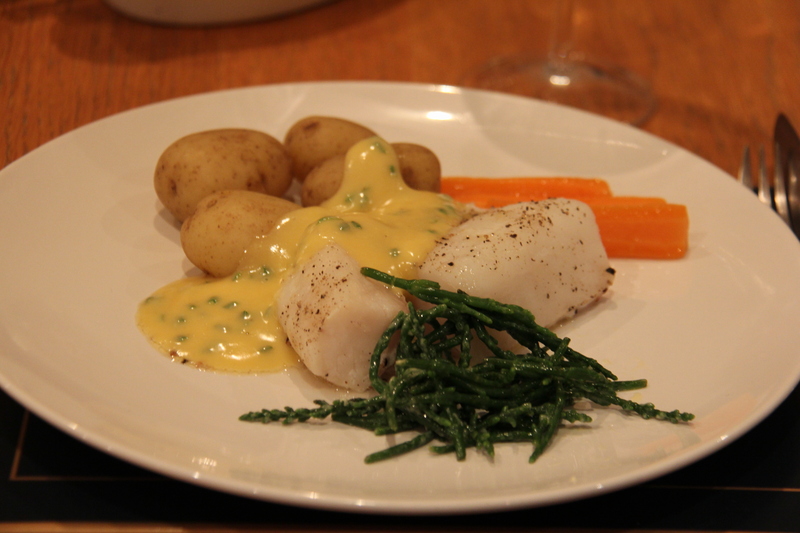 We decided together in Whole Foods that cod loin was a good way to go and it most certainly was, with new potatoes, carrots and samphire. And generous helpings of the most amazing brown butter hollandaise sauce ever. Boil the potatoes in one pan and the carrots in another. Place the cod (cut into portions) in an oven tray and season. Bake in 100C oven until the inner temp is 43C. Leave to rest under tin foil. Cook the samphire in a little water with a knob of butter added for a few minutes until a little soft. Drain. Keep the vegetables warm while making the sauce. Gently heat the egg yolks in a non-stick pan while whisking. Add 1 tbsp lemon juice and stir until the yolks starts to thicken. Add the butter cubes a few at the time, stirring as they melt. Repeat until all the butter cubes have melted. Add the brown butter little by little while the sauce thickens. Season to taste and add more lemon juice if needed. Continue stirring with the whisk until pouring the sauce into a cold serving bowl. Add the chives and serve. I cooked (and ate!) a lot of nice food when I was back home in Sweden in August. But my family and I have a tendency to get a bit overboard sometimes. So one day we decided to not make an elaborate three course meal. 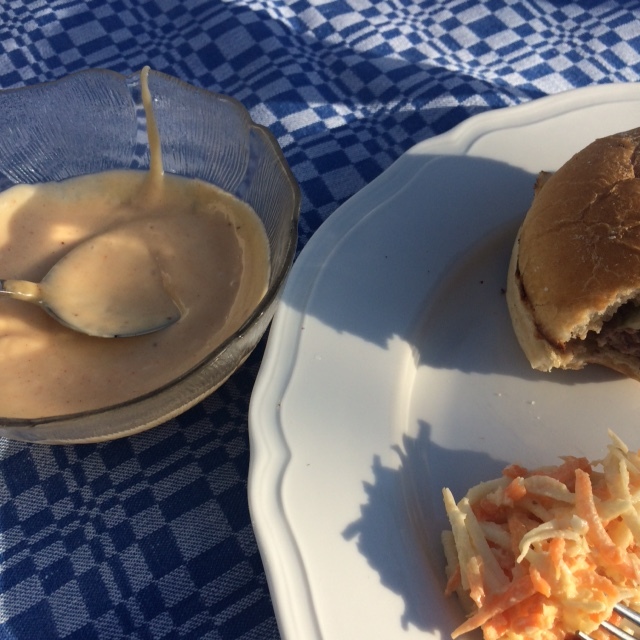 Instead we had these yummy homemade burgers with a homemade version of the Shake Shack sauce. So good! I first saw the Fake Shack sauce recipe on Smitten Kitchen’s wonderful blog and knew I just had to make it. And it hit the spot just as I thought it would. My parents liked it too and from now on this is definitely my go-to burger sauce. Mix the ingredients, taste and adjust the flavour until you’re happy with the balance. Serve with burgers. No, this is not what we eat every day in Sweden but I so wish it was! My first evening at the summer house (a Saturday) my parents and I had a proper seafood feast to celebrate being together again and my birthday the week before. 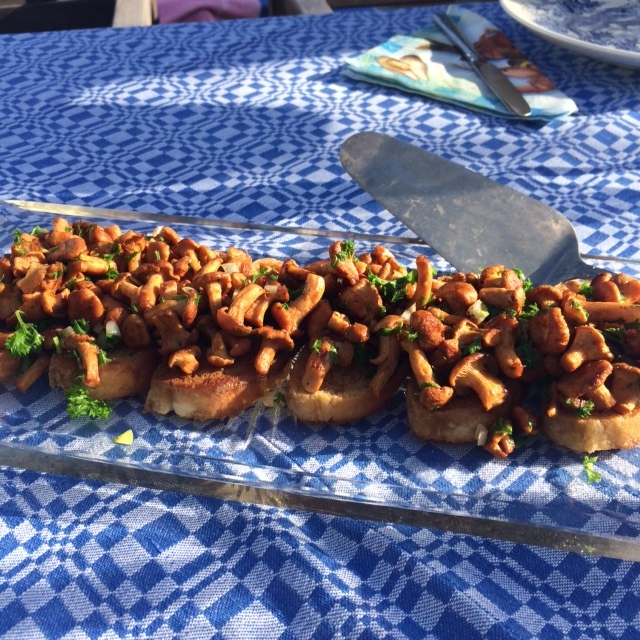 We love girolles almost as much as we love seafood and as they’re in season we started off with a proper girolle toast (fry the bread in butter, fry the girolles in more butter with garlic, add parsley) and bubbly and then got serious about the seafood. 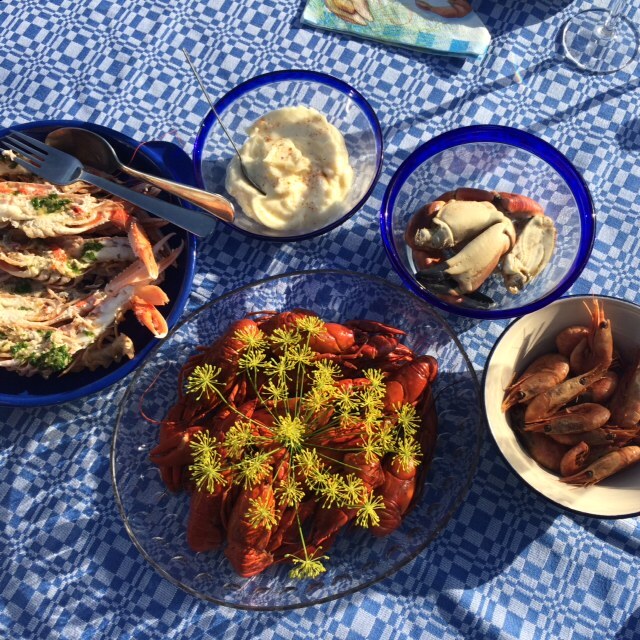 We had langoustines with garlic butter, fresh Swedish crayfish (such a treat! ), crab claws and smoked prawns. Smoked prawns may sound weird but they are oh so delicious! It was such a wonderful meal with amazing seafood, great company and the accompaniment of bread, cheese and home made mayonnaise. Mix the egg yolk with mustard and vinegar. Beat the egg mixture while adding the oil drop by drop. When the mixture has thickened you can add the oil in a thin spurt. Season to taste with lemon juice, salt and pepper.